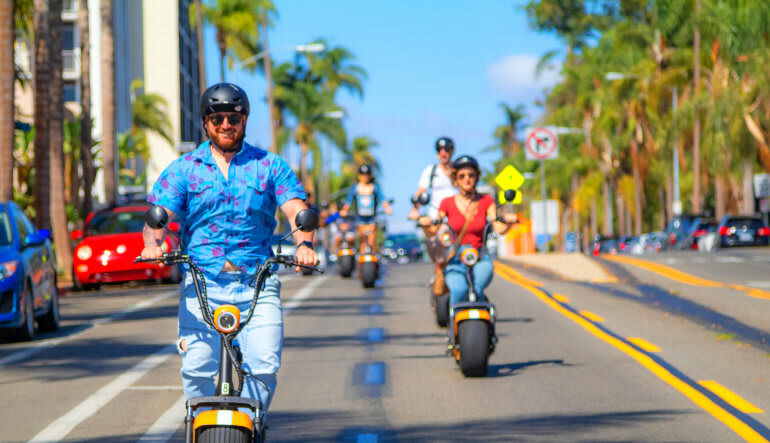 Take a colorful tour of San Diego on a Phat Scooter! These modern, fully electric vehicles feature wide tires, making them a cinch to handle even without any riding experience. 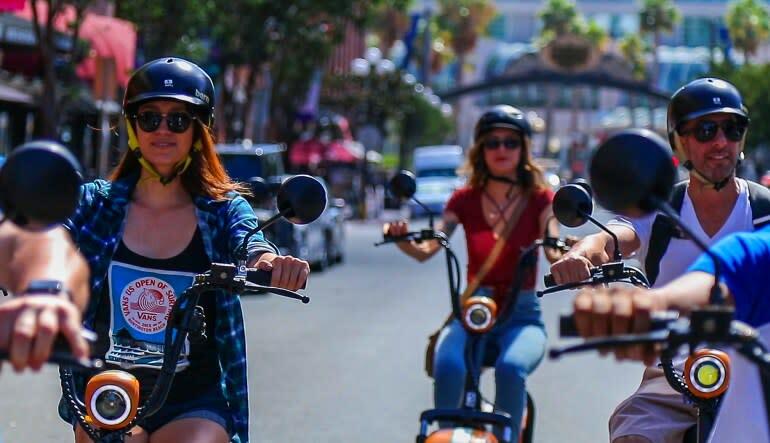 Take a colorful tour of San Diego on a Phat Scooter! These modern, fully electric vehicles feature wide tires, making them a cinch to handle even without any riding experience. In fact, with this guided San Diego tour, you don’t even need a license! 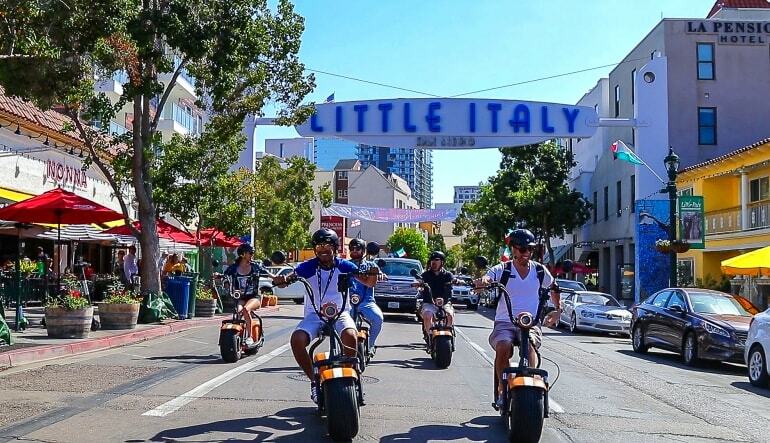 As you zoom through Little Italy, head to the USS Midway and travel into Gaslamp Quarter, you’ll be guided by a GPS that not only sends you in the right direction but also offers fun facts about all the attractions you encounter. And because it’s a GPS guided tour, you can even take a few detours without worrying about getting lost—travel at your own pace! 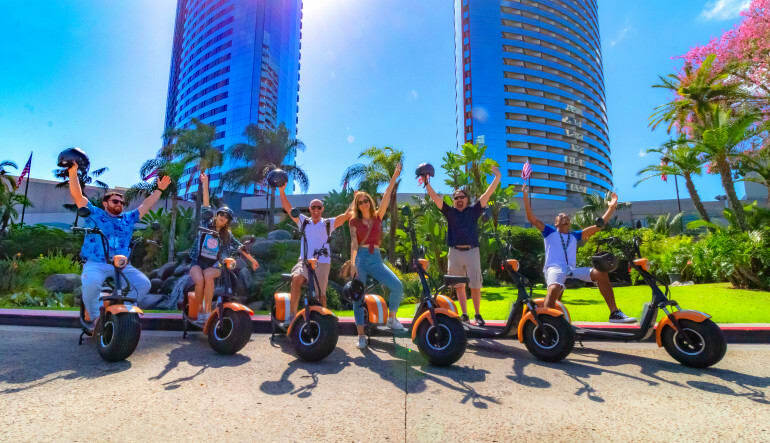 Take a 1 hr Phat Scooter guided San Diego tour! Start the tour with a quick riding instruction (the foolproof designs make riding easy for everyone)! Be enticed by the colorful boutiques and delectable scents of Little Italy. Pass the Maritime History Museum and USS Midway. Travel into beautiful Seaport Village. See Horton Plaza (you’ll definitely want to visit after the tour)! Continue into the heart of San Diego before looping around Petco Park! Travel into historic Gaslamp Quarter, known for its bustling nightlife and restaurants. Enter Banker’s Hill and travel around Balboa Park. Know where you’re going with the help of a GPS that shares fun facts about each neighborhood! It’s the perfect outing for birthdays, anniversaries or simply a fun afternoon with the gang. Book your San Diego city tour today and enjoy the fresh air!